As the pace of life gets faster it becomes even more important to spend our weekends doing activities that refuel and reenergise us. However, we often complain that our weekends simply aren't long enough to refuel us sufficiently. Over time this energy deficit leaves us feeling worn out, disenchanted and drained by life. We all live for those glorious bank holidays were we get an extra day tagged onto our weekends but for the most part our leisure time is short and sweet. So how can we stretch time in order to get more out of those special weekend hours? According to David Eagleman, Professor at Stanford University and author of The Brain: The Story of You, the key to extending your weekend is to seek out newness. He explains that when we are around new stimuli that is unfamiliar to us our brains use more processing power and collect more data from our environment. In doing so it creates a more thorough memory of the experience and as you reflect upon that memory it feels as though there was more time. So for those of you who always feel short changed by your weekend the key to 'stretching time' is to pursue new settings, experiences and activities. The last few weeks Leigh and I have been spending all of our leisure hours in the same setting doing the same activities, working on renovating the house. We've just bought our first home together, a 3 bedroomed detached family house a few moments from the beach and we are in the process of knocking down internal walls, opening up the back of the house, building bespoke kitchens from scratch, laying floors and building extensions in the back garden. Its an absolute mission but were keen to have made significant progress before our wedding in September. The other night I looked at Leigh and could see that he was running on vapours of energy. He was absolutely knackered and was still talking about fire places and flooring (bless his cotton socks). In that moment I knew I had to put a 'pause' in. I made a cup of tea and sat him down, we chatted things over and agreed that enjoying the process was way more important than hitting our self imposed deadline and decided to find a weekend in the next few weeks to indulge ourselves in a new environment. We needed a bit of indulgence in our life just for a couple of days so I scoured the internet for a suitable abode. 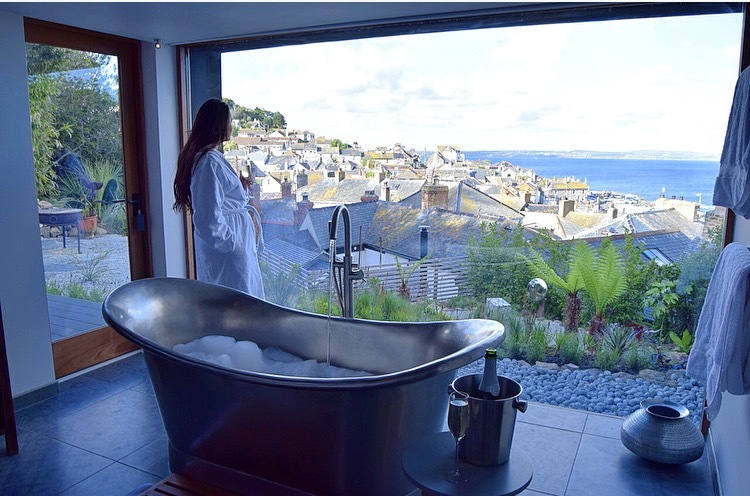 We booked a two night stay at a brand new luxury love-nest in Mousehole, south Cornwall. Neither of us has spent much time in Mousehole and we were craving a change of scenery. We didn't have the energy to catch flights for a short break overseas so the convenient hour drive from our house was just what we needed. 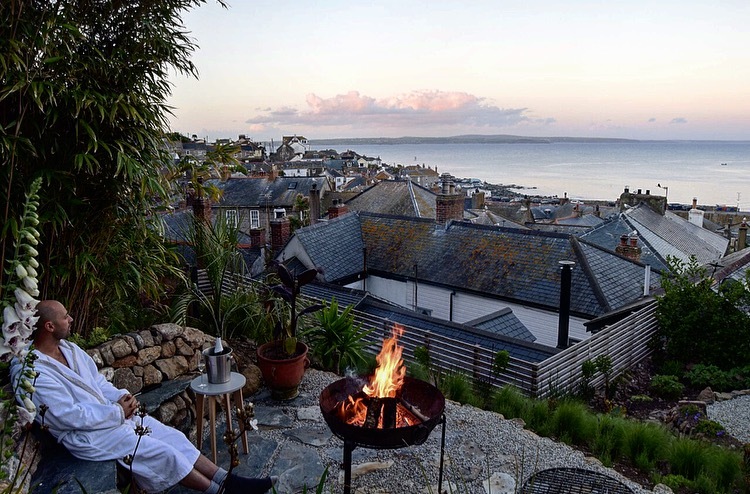 Moushole is a completely adorable tiny Cornish fishing harbour full of narrow streets lined with fishermans cottages. 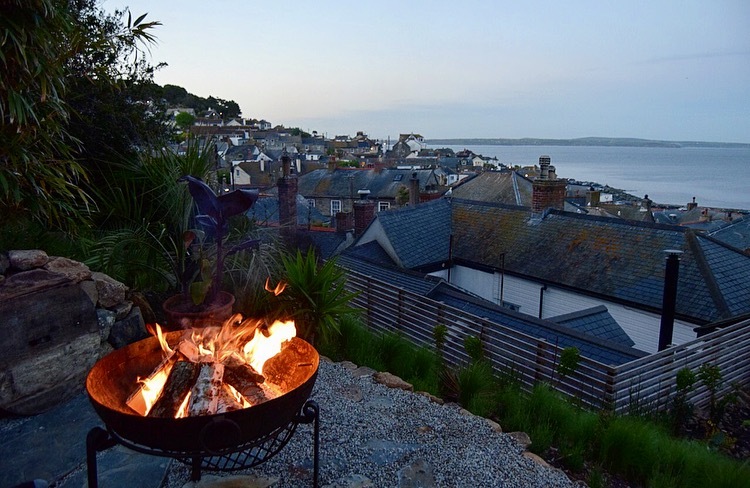 This rental is tucked away into the hillside and has outstanding views of the harbour. As people who are energised by the sea it was important that wherever we chose to stay had a sea views. The unrestricted views that Fallen Angel had to offer did not dissapoint. We decided that our focus for this weekend was to spend some quality time together, eat well, soak up the luxury of our new environment and only venture out if we wanted to rather than feeling that we 'should do'. This was one weekend were we didn't want to have the clock controlling us. We arrived in the afternoon and parked our car in the designated spot. The streets are so narrow in Moushole that none of the houses have parking. Most people would see this as an inconvenience but for us it all added to the enchantment of the setting and given that it was only a few minutes walk from the house it wasn't too much of a problem. When we arrived I felt giddy with excitement. As someone who loves interior design, the sea and anything with a story, to see all these things come together in one building is quite a treat. The gate that you enter through to get up to Fallen Angel is an antique door salvaged from a Moroccan village and brought over. I couldn't help but wonder what house it had belonged to previously. The steps up to the property have been created by using sleepers but not the kind you get from the garden centre. These sleepers were previously Falmouth Dock! 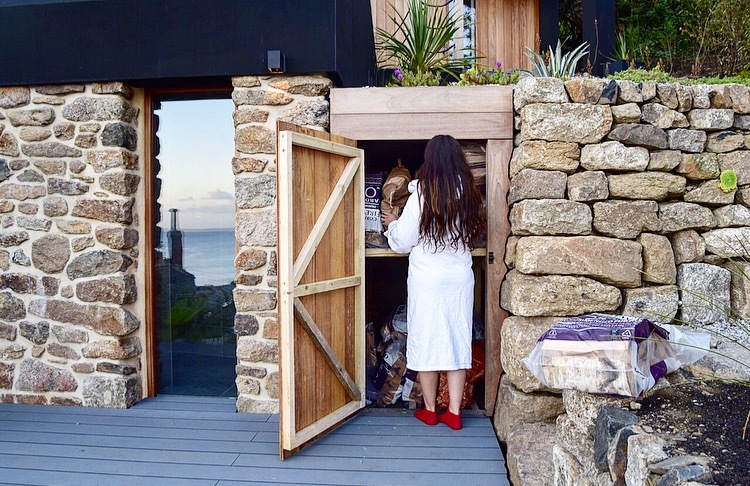 The history in this brand new build is captivating and I found myself asking Jane (the owner) a tonne of questions about literally everything. "What wood is this? ", "How did you do that? ", "Who designed your garden?" (only one of the best landscapers in cornwall in case you're wondering). She was wonderfully gracious in appeasing my curiosity. 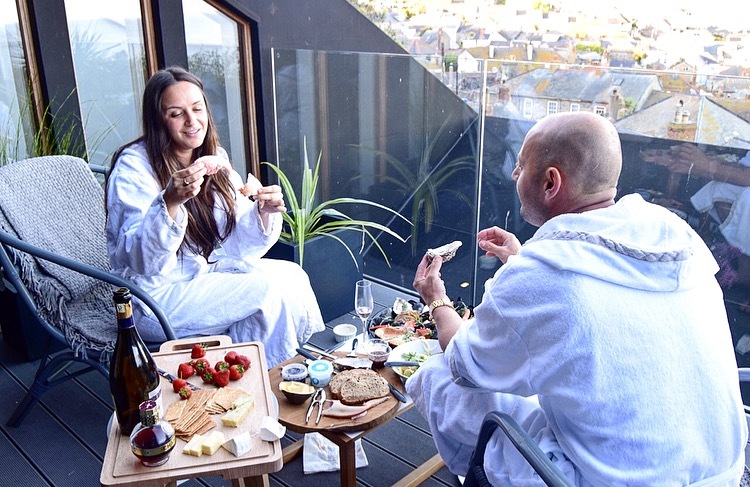 Within minutes of Jane handing over the keys to us we popped open a bottle of Prosecco and took it down to the terrace with a bottle of Chombard. 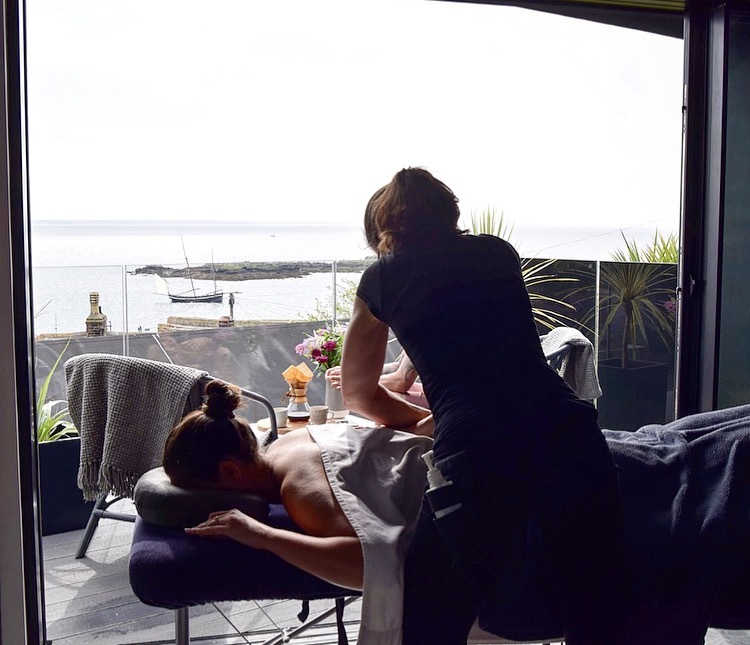 The terrace is a perfectly positioned sun trap that overlooks the bay. 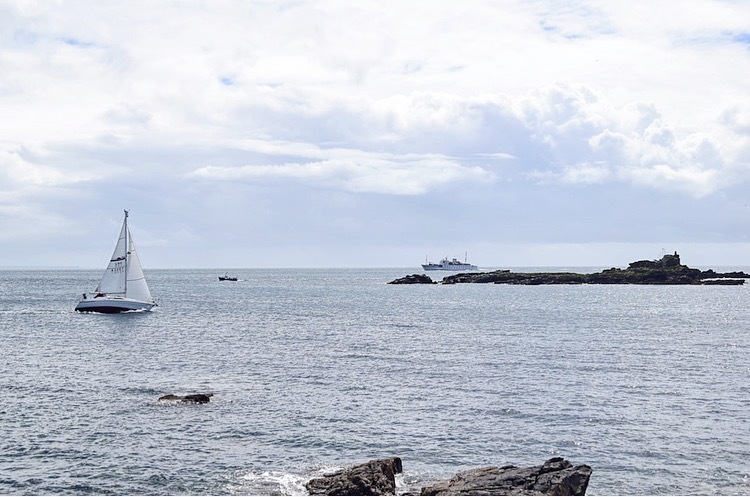 There was an old boat that had just moored up in the harbour and was taking their sails down. By the time they had finished and were in their rowing boat heading back to shore our bottle was empty. The terrace was a great vantage point to watch the world go by at sea. We headed for the bath tub and can you blame us. 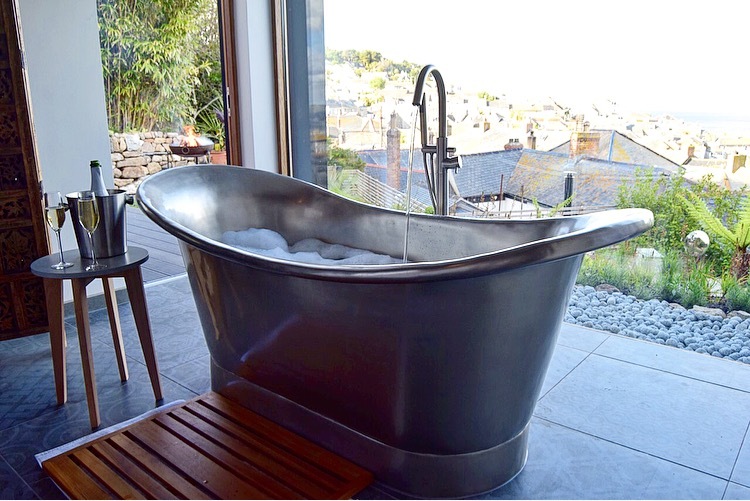 Have you ever seen a bath tub as inviting as this one? Room for two and the view of the harbour. The great thing about there being a view out front is that the whole towns windows are orientated towards the sea leaving you to prance about naked behind them. Despite the whole wall in the bathroom being made out of glass you still feel so contained and private. The wet room style shower also had a ceiling to floor window meaning that theres barely anything you can do in this house where you're not simultaneously soaking in the view. It's complete perfection. After a long soak in the bath we had a hamper delivered to our door. It came beautifully presented in a wicker basket and all we had to do was pop our starters and dessert in the oven for 7 minutes each and we suddenly had a luxury 3 course room service. We took it out onto the 1st floor Balcony and tucked in. The hamper was provided by indulgence Catering and cost £100 for the two of us. We had two Salmon and goats cheese soufflés to start with Baker tom sour dough bread and smoked butter. 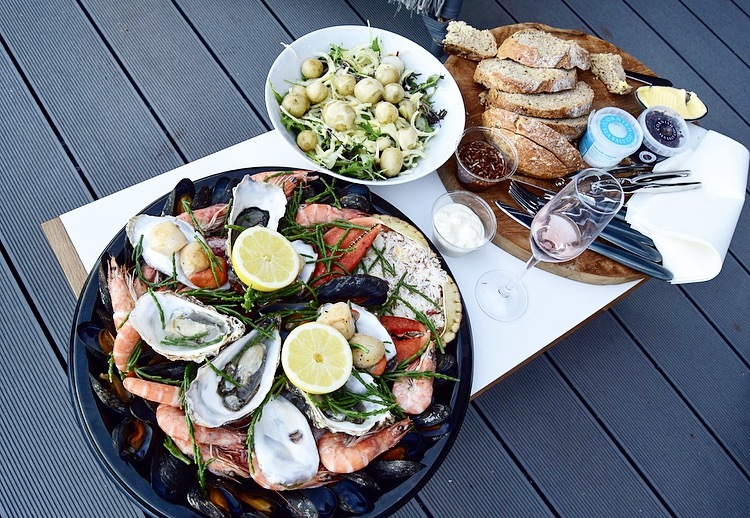 The most insane fruit de la mer platter for mains which consisted of Scallops, mussels, oysters, crab, a whole lobster, king prawn and samphire along with multiple dips and dressings. This also came with pre cooked boiled potato and a fennel salad. For dessert there was the most scrumptious and gooey chocolate fondants and a cheese board to top it all off with sea salt crackers and strawberries. I eat fish a lot but this platter was the best either of us have ever had. Not only was it generous in portion size but everything tasted super fresh which isn't too surprising considering that Newlyn Harbour (A major fishing port) is only 5mins away. 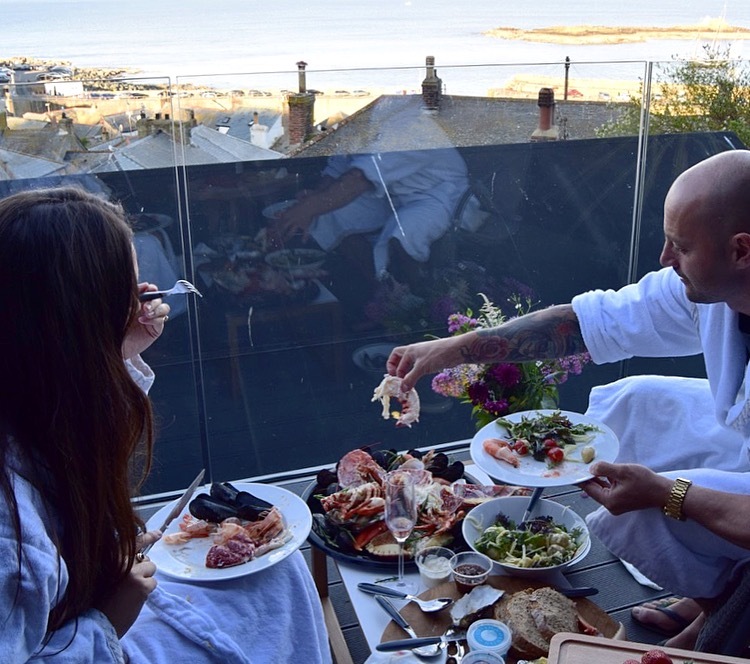 It was great for our first evening because it meant that we could spend the whole evening just chilling out and doing exactly what we came here for, some us time, and didn't need to rush about getting ready to go out for dinner. 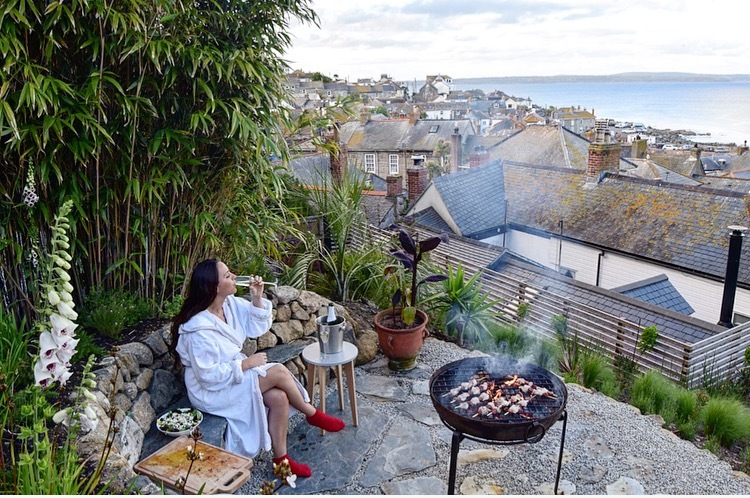 After dinner we donned our bath robes and watched the sun go down around the Indian fire pit on the terrace. 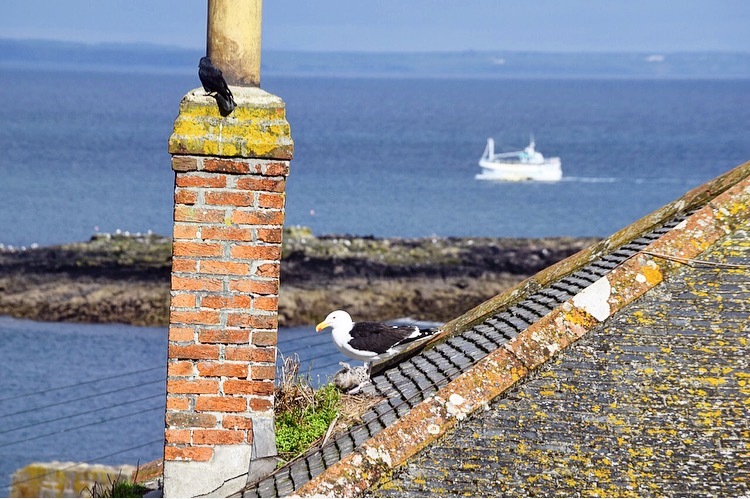 The local birds nest on the cottage roof tops in Mousehole and from this panoramic perspective the evenings are quite a sight watching all the birds return to feed their chicks and nestle down for the evening. Theres something so calming about watching the simplest tasks in nature unfold before you. That evening we purposely left the shutters open in the bedroom and at around 5am the following morning we watched the most beautiful sunrise across the bay. Its magical starting your day in this way and the icing on the top was an early morning deep tissue massage by Stacey Ebel. Jane, the owner, was super helpful in making suggestions and recommendations for our stay and ensured that everything we needed was taken care of. She booked Stacey to massage me and put us in contact with the caterers. It made the planning process stress free and the weekend flowed really well as a result. The following day we decided that we had refuelled enough to leave the house. We headed into the town (a 2-3 mins walk from Fallen Angel) and had breakfast at 2 Fore Street. Leigh had the full Cornish breakfast and I had the fruit yoghurt muesli (I hate it when we fulfil gender stenotypes but that is what went down that morning). After that we walked the coastal path to Newlyn and checked out the antique shops and delicatessens that have opened there. Apparently theres also a fab Gin bar above the cinema but it was a little too early in the day for us to get started on gin so we opted for a taxi back to Moushole (a fiver) and a wonder around the village instead. 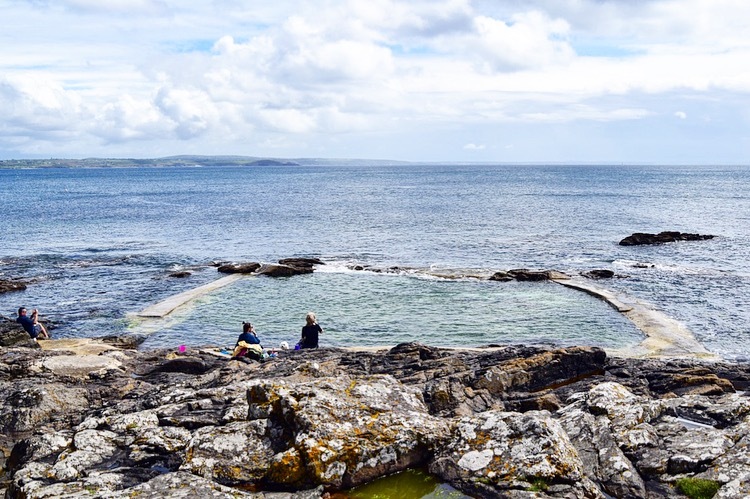 Theres a fab little cafe in Moushole called the Rockpool which overlooks a man made sea pool in the bay, perfect on those super hot days. Theres also The Coast Guard pub on the harbour if you fancy something more substantial and Hole Foods Delhi sells a variety of Cornish products. There's just enough food places so that you dont feel cut off but equally aren't overwhelmed by their presence. Again this all adds to the charm and character of the place. After getting back to the apartment we had yet another bath, but seriously you would too. Leigh isn't even a bath person but by the end of the weekend it was him who was suggesting we have another soak. I cooked some awesome food on the bbq which I'm going to save for another blog post and then watched the sun go down again around a fire pit. Overall this weekend was exactly what we both needed. A complete change of scenery and activities in a luxury setting where we could indulge all of our senses. So It turns out Professor David Eagleman at Stanford University was right, our weekend really did feel longer and more energising after we had sought out newness. If you're looking for a weekend of indulgence I can't recommend Fallen Angel enough. 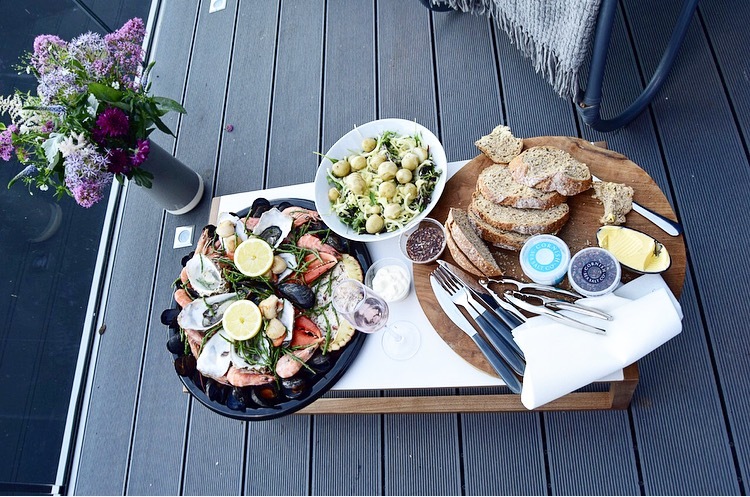 Just promise me one thing, you have the seafood platter and report back! Check your inbox for the confirmation email. If its not there, check out your junk mail.